Copperheads are one of the most commonly encountered venomous snakes in the southeastern United States. Unlike many species that are unable to cope with human altered habitats, copperheads often thrive in disturbed areas. Copperhead bites are serious, but fatalities are exceedingly rare, and the shy snakes will only bite if you handle or step on them. Identify baby copperheads by observing several different criteria, including their pattern, tail tip and body shape. Five different subspecies of the copperhead inhabit North America. Northern copperheads (Agkistrodon contortrix mokasen) live throughout the low mountains and piedmont of the southeastern United States, while southern copperheads (A. c. contortix) inhabit the coastal plain of the Southeastern United States. Moving west, Osage copperheads (A. c. phaeogaster) range throughout Missouri, Kansas and parks of Oklahoma. The broad-banded copperhead (A. c. laticinctus) replaces the Osage copperhead to the south of its range. The Trans-Pecos copperhead (A. c. pictigaster) lives only in southwest Texas. Integration between the subspecies is common along adjacent portions of their range; an individual specimen may resemble either of the discrete subspecies or a combination thereof. Copperheads have elliptical eyes, facial pits and a single row of subcaudal scales, but observing these traits requires you to have close interaction with a potentially dangerous animal. Instead, use the color pattern, tail tip and body shape of a snake to identify baby copperheads from a safe distance. Amateurs should never approach or handle a copperhead. This extends to dead animals as well; dead venomous snakes may bite reflexively for hours after death. In general, copperheads have beige, brown or tan ground colors. On top of their ground color, copperheads have dark brown, lateral markings that are roughly triangular in most subspecies; these triangles sometimes touch along the midline of the back creating an hourglass-like pattern. Southern copperheads are the palest subspecies, and have the thinnest hourglasses -- a high number of which do not meet along the mid line. Northern copperheads are the darkest subspecies, and have relatively thick hourglasses that connect more frequently than those of the southern subspecies do. The Osage copperhead’s color is usually intermediate between the northern and southern subspecies, but their dark pattern elements have white borders. The triangular markings of the broad-banded and Trans-Pecos copperheads have evolved into wide, sometimes broken, bands. It can be difficult to distinguish between these two subspecies at a distance. The juveniles of all subspecies are often several shades lighter in color than the adults are. 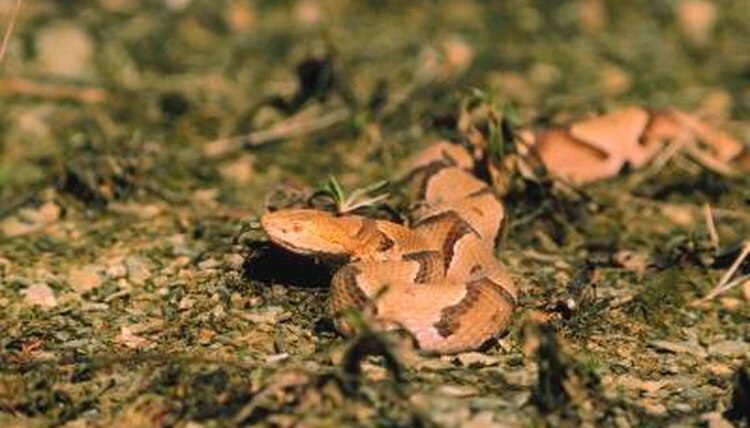 The head of copperheads can vary from tan to dark brown. Young copperheads have bright yellow tail tips. The young animals put the tips to good use: Lying camouflaged within the leaf litter, the snakes will entice frogs and lizards into striking range by wiggling their tails in a manner that suggests a small worm or caterpillar. The tails become brown as the animals mature, and their menu of potential prey increases. Copperheads of all ages will vibrate their tails rapidly in the leaf litter when frightened, but this behavior is common among many nonvenomous species as well. Though copperheads do not reach very long lengths -- generally less than 3 feet -- they are stocky, large bodied animals for their size. Their heads are somewhat diamond shaped, and set off very distinctly from the neck. Many nonvenomous snakes engage in body and head flattening displays when frightened, so body shape alone does not provide a positive identification, but can provide an important clue. What Types of Snakes Can Flare Their Necks & Hoods?